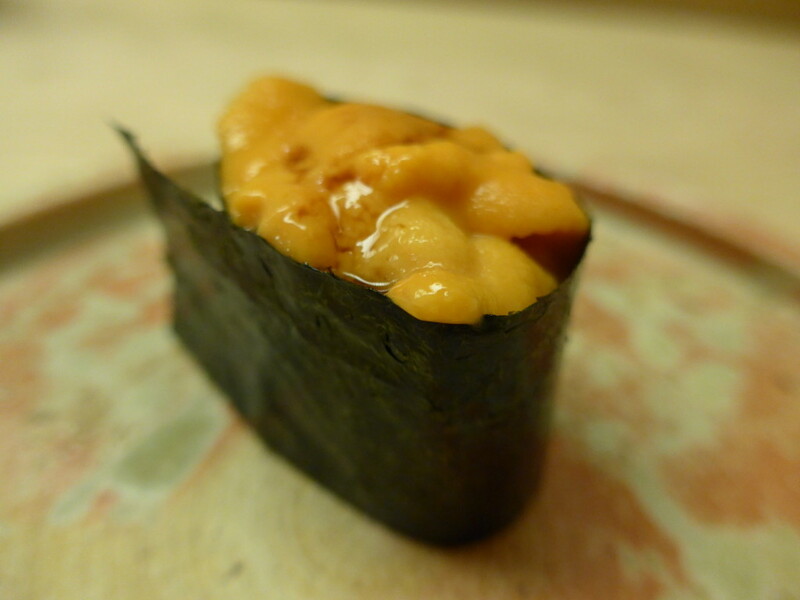 One must just try the unctuous contents of the spiky sea urchin and allow for this divine feeling penetrate each cell of the body - from the mouth to belly, the uni moves you like a lasting vibration of a guitar string. 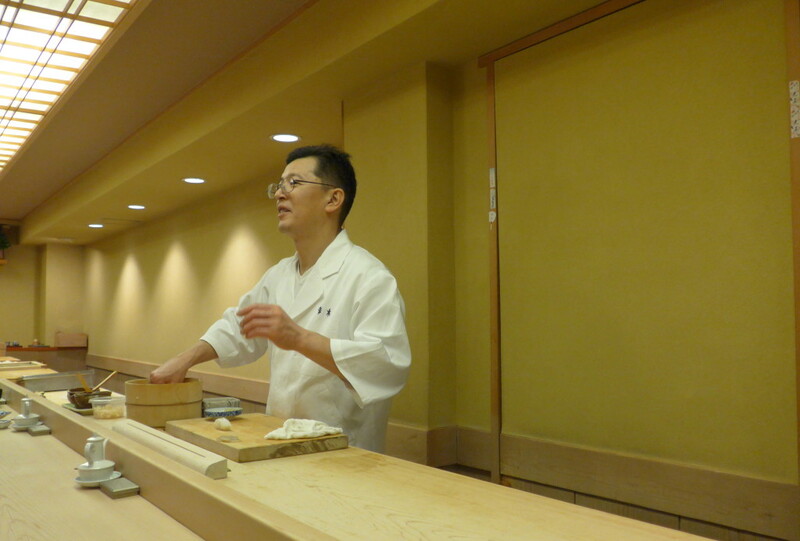 The master sushi chef Toshikatsu Aoki took over his father’s restaurant SUSHI AOKI in 1993. On weekdays he operates his restaurant in Ginza and on Sundays at his other branch in the Nishi-Azabu neighbourhood, both in Tokyo. GINZA SUSHI AOKI was awarded one star in the Tokyo Michelin Guide for 4 consecutive years not for being original in combining uncommon multiple ingredients as Michelin often ranks high in the West, but for being faithful to the traditional mastery of edomae sushi (Tokyo used to be titled Edo) employing the finest available ingredients. 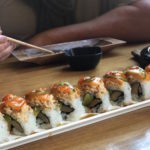 Cuisine: Japanese sushi and tsumami (snack) rice bowls (layered with fish, seafood, meat or vegetables) for lunch, omakase nigiri sushi and sashimi adjustable to guest’s requirements for dinner. Price: Very high (For lunch it is much cheaper as multiple set menus are available although these have to be paid in cash; for dinner credit cards can be used – Standard:￥10,00; Special:￥15,000; Deluxe:￥20,000 – the higher the price is, the better quality of the ingredients). 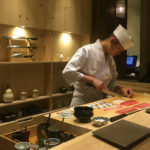 You can watch the art of slicing, dicing, chopping, forming and arranging of the sushi rice buns and rolls right in front of you as your chef prepares all the raw courses behind the wooden counter. Simple interior, no windows, natural colours, all spread across several floors with a private room that accommodates up to 10 people. 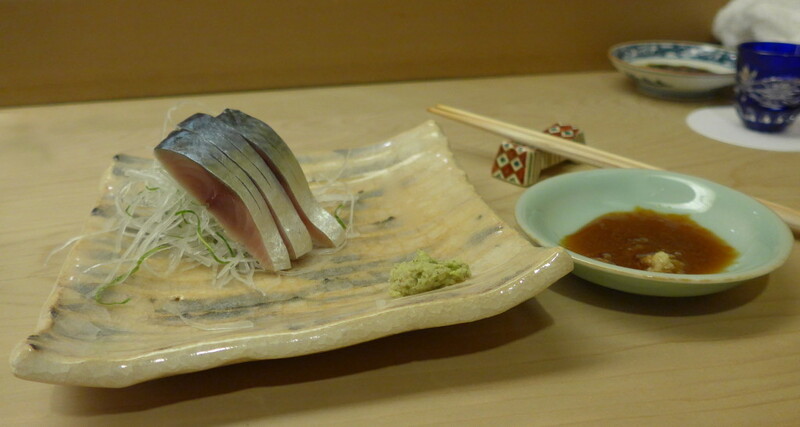 Like most sushi spots in Tokyo, it is very casual. 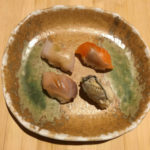 Seasonal and daily changing sushi toppings are selected according to the freshest ingredients that the chef finds every morning (except Sunday) on the legendary Tsukiji fish market in Tokyo. 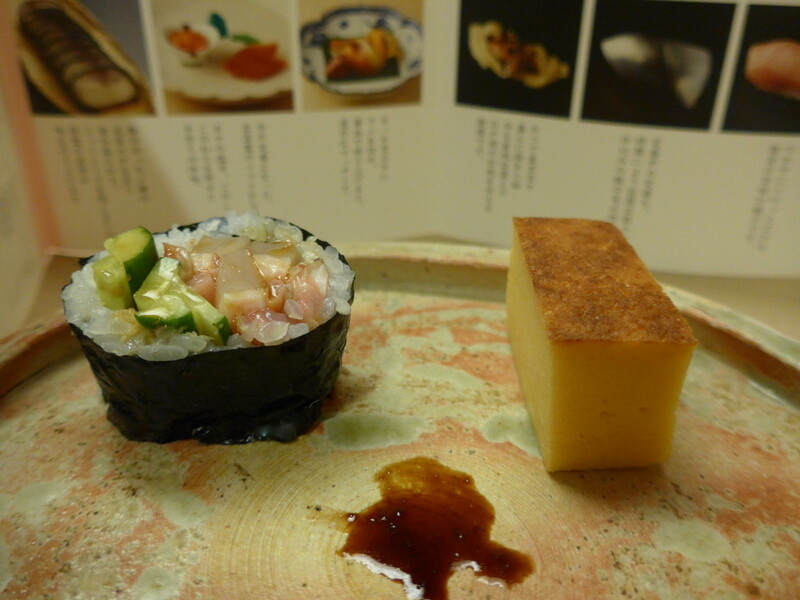 Both tsumami or nigiri zushi (sushi) can be adjusted to your request. 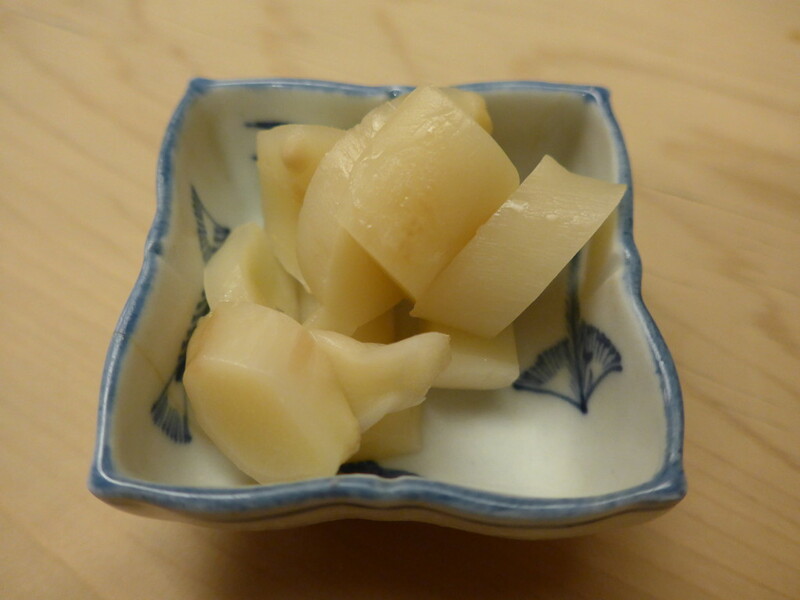 “Tsumami” is a relish that is said to go well with alcoholic beverages, so sake flows constantly. I like to get a mix of sashimi and sushi, otherwise it is just too much rice and some fish stands out better just sliced like sashimi. 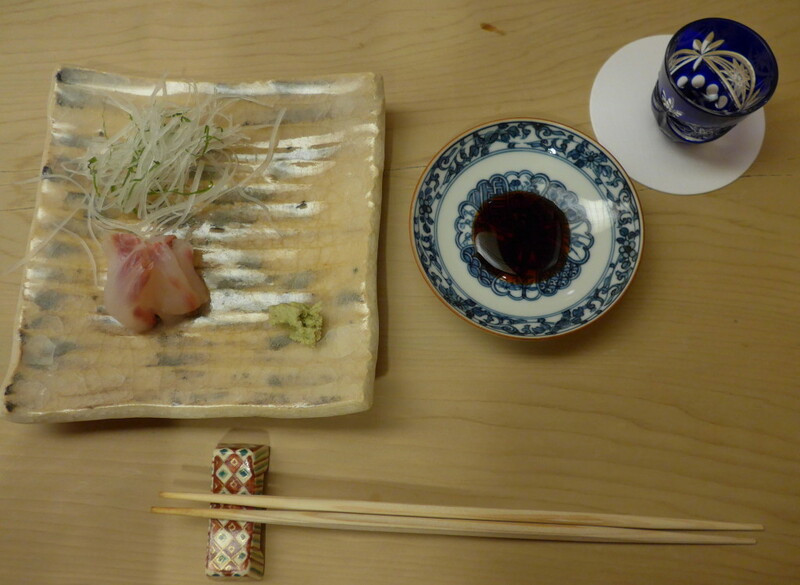 The best Spanish mackerel sashimi I have eaten to date was at Sushi Aoki. 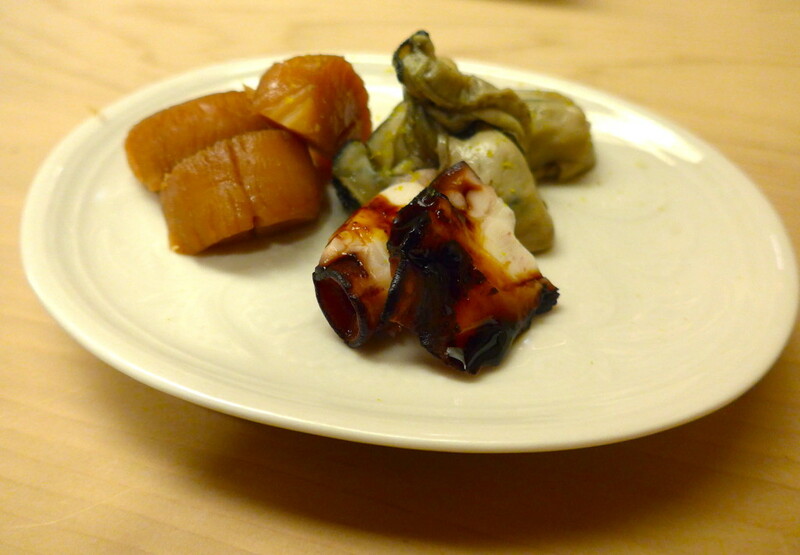 The squid looked like a chewy mushroom, but was tender and crisp, far from being a sea version of a marshmallow. For some, this might be an adventurous course. Nevertheless, the trio of marinated oysters, scallops and octopus is delightful so shed any worries and dive in as more quirky food is about to come. 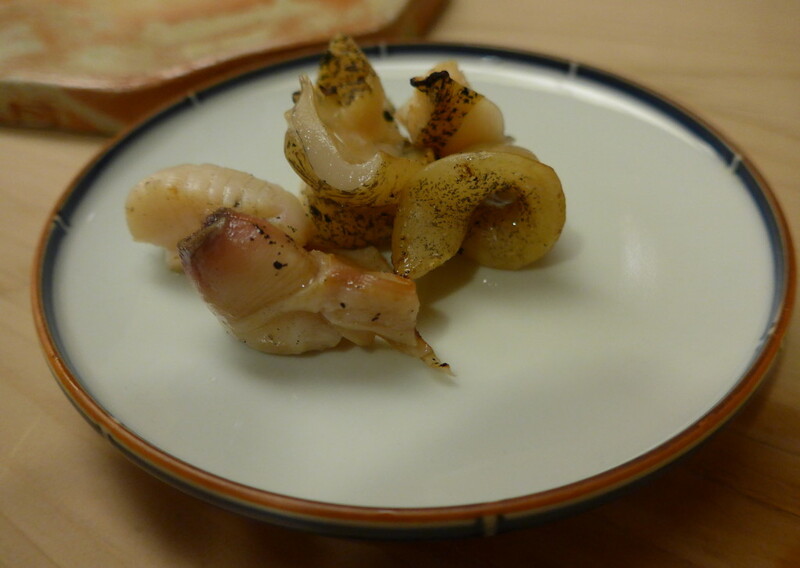 The smoked squid may look unattractive, but not everything lacking its visual appeal is bad on the palate. Like with people, getting to know these sea creatures through more senses, one concludes how wonderful they are! In between all these diverse plates refreshing one’s palate with a mouthful of zesty ginger is must. 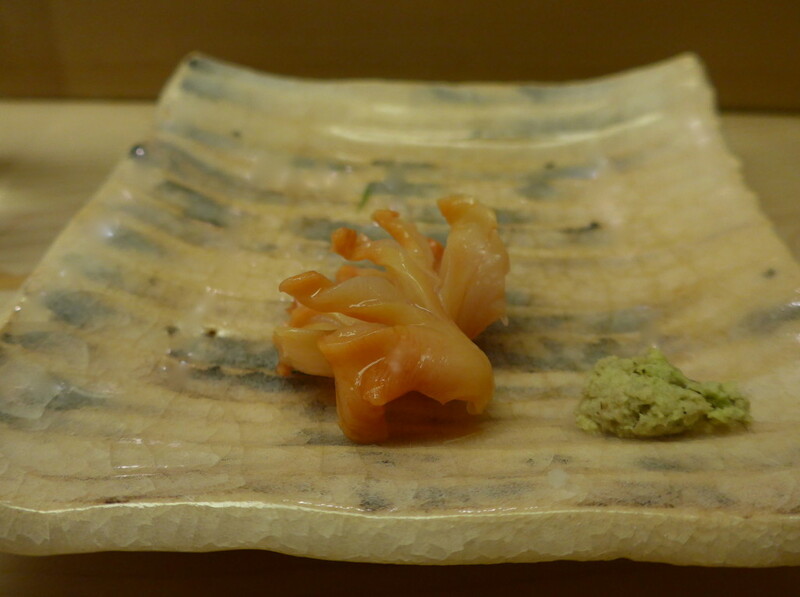 At Sushi Aoki they serve the palate invigorating, in vinegar marinated ginger cut in chunks, not grated. 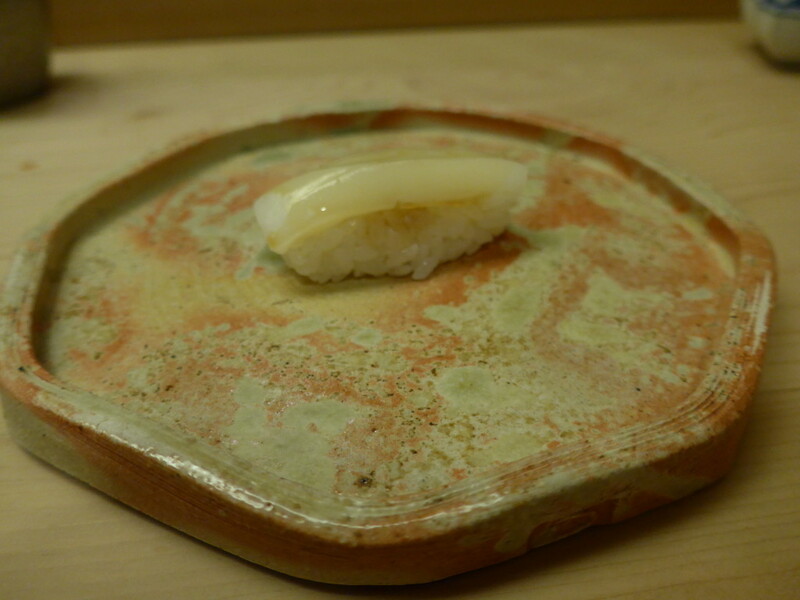 The white fluke on a rice bun melted softly in my mouth, and I am reminded of the art of making the perfect rice for sushi. Each chef has his own recipe and his own preferred rice. 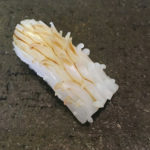 Moreover, there are hundreds or perhaps even thousands of different types of rice that change from the field to the producer polishing the rice, which is challenging for anyone seeking the perfect texture and stickiness needed for the best sushi rice. At Sushi Aoki they found the prefect rice. Sticky enough to keep shape, yet not mushy with grains sensed on the palate. After a superb white sea eel aka sawani, chu- and o-toro aka medium fat and fatty tuna, and a squid sushi came the crème de la crème of our dinner, the exquisite Hokkaido uni. 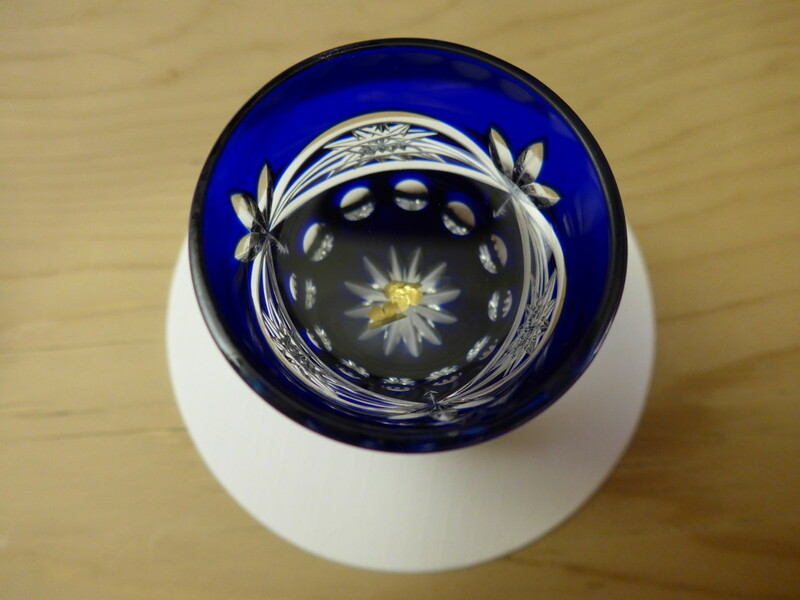 There are no words to perfectly describe its delicate, almost orgasmic texture. One must just try the unctuous contents of the spiky sea urchin and allow for this divine feeling penetrate each cell of the body – from the mouth to belly, the uni moves you like a lasting vibration of a guitar string. Concluding the multi-course omakase dinner with an unexpectedly tasty vegetarian roll. Usually, I find the cucumber rolls quite boring, but this one had savoury Japanese pickles included as well. The omnipresent tamago – a sweet egg omelet shaped into a cake that you either love or hate – is customarily served at the end of each traditional omakase course. 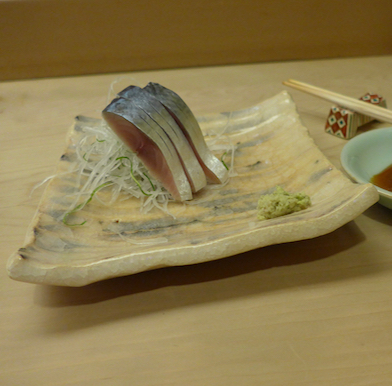 At Sushi Aoki this combo naturally swung from the seafood to the warm tea served to sooth your belly before moving on. Drinks: There are not many wines on the list, but if you insist on some alcoholic grape-based tipple, you will find a good match. The sake selection is much better and worth exploring. Let the server recommend you the right sake according to your taste preferences. Do you like it more sweet, stronger or rather plummy, fruity? At Sushi Aoki they will find the best drinking partner to accompany your meal. Green tea is served upon request throughout the dinner. I dined at the Ginza location. Takahashi Building, 2nd Floor, 7-4, Ginza 6-chome, Chuo-ku, Tokyo, Japan. Palais Royal Building, 1st Floor, 23-7, Nishi-Azabu 3-chome, Minato-ku, Tokyo, Japan.